If you don’t have a lot of bandwidth, transcoding can help. It takes one stream (a SOURCE) and breaks it up and re-broadcasts into several streams with different Bit Rates / Formats (the OUTPUTS). So for example, you can send one SHOUTcast stream at 128 kbps to us and we can split it into a 32 kbps MP3 and a 64 kbps AAC+ stream. The combinations are limitless. The only rule is the output stream(s) should be a lower Bit Rate than the Source stream. The reason is the quality will be degraded if you try to send it to a higher Bit Rate (eg. sending a 128 kbps > 256 kbps). We are one of the handful of Stream Hosts that provide this service. It is CPU intensive and most companies do not have the resources to do it. Also we are the cheapest transcoding provider out there. Only $5.00 US for the 1st output and $3.00 US for each additional output stream. Compare that to the UK company charging $13.00 US for the 1st output. Why you should choose us to Transcode? We have been doing it for 10 years and we know the best combination of Bit Rates / Sample Rates to choose. For example, we had a client that wanted to have a 24 kbps stream in Stereo. After showing him how much better it sounded in Mono, he was convinced. What Formats can I do ? 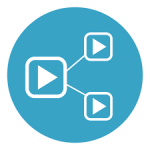 The input can be either a SHOUTcast MP3 stream or an ICEcast stream. 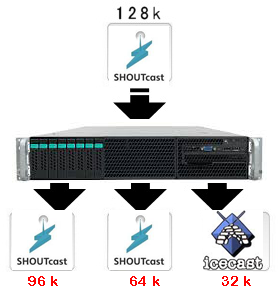 The output(s) can be SHOUTcast (version 1 or version 2), AAC+ or ICEcast. How reliable is your service ? Every 5 minutes we check the status of all of your streams. If any of the output streams are down, we re-start the transcoder, which brings all streams back on line. Of course, the SOURCE stream is your responsibility, and we have no control over that. Who Supplies the Servers ? It is your responsibility to supply the SOURCE server. We will supply a FREE Output Server with up to 10 Concurrent Listeners. If you want more listeners, either you must supply your own OUTPUT server or order more Listener Slots through us.